Saliskipper's body is slick with a thin film of slimy ammonia. Their slippery and moist skin is easily dried out, meaning they can be found near large bodies of water, but much prefer a cool, damp cave such as Dew Cave. Its signature move Ammon-Yawn inflicts a harsh infection on the foe, stripping its defenses and wearing down its health. 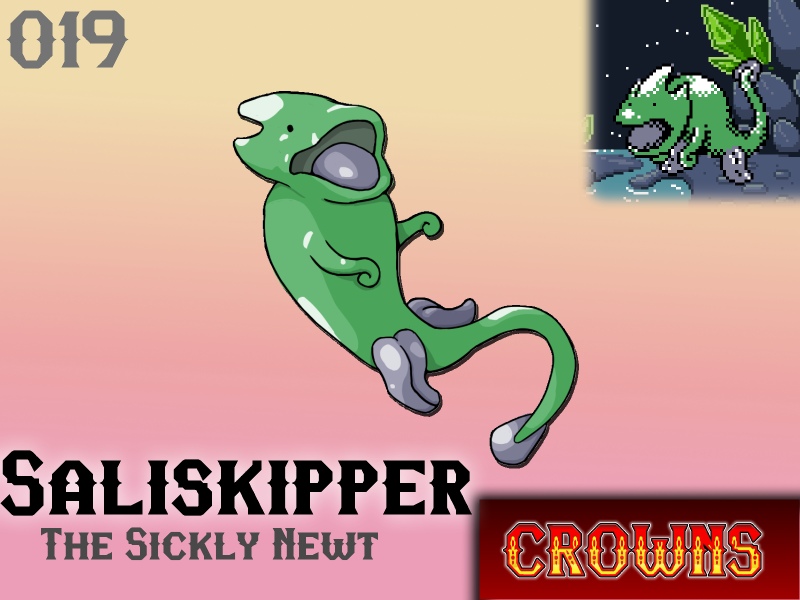 Saliskipper are low on the intelligence scale, making them an easy recruit for the low-end, non-tamer thugs of Crown Island. While Saliskipper can seem like an ideal conquest for new tamers, they are generally avoided due to the frequent sicknesses and colds afflicting those that spend any length of time with them. Will Saliskipper make your team?